Archbishop Timothy Broglio, Bishop Alvaro Ramazzini, Archbishop Pedro Barreto, Bishop Roque Paloschi and Bishop Donald Bolen stand before the Inter-American Commission on Human Rights. At a historic hearing before the Inter-American Commission on Human Rights yesterday, bishops representing the Latin American Episcopal Conference, CELAM, testified on the effects of exploitative practices of mining and extractive industries on communities and the environment in Latin America. Joined by Archbishop Timothy Broglio, representing the USCCB, and Bishop Donald Bolen, representing the bishops of Canada, Peruvian Archbishop Pedro Barreto, Guatemalan Bishop Alvaro Ramazzini, and Bishop Roque Paloschi of Brazil detailed in strong and compelling terms the human rights, public health and environmental consequences related to operations in Latin America by U.S. and Canadian mining companies. They urged that U.S. and Canadian mining companies be held accountable to laws and standards that protect local economies, the environment, indigenous communities and vulnerable groups even when operating outside of the country. The extraction of natural resources, such as oil, gas and minerals, is a central feature of modern economies. Without a doubt, extractive industries can contribute to economic development and opportunity. When exploited improperly, they also bring about social conflict, feed corruption, displace people from homes and lands, pollute air, rivers and seas and destroy people’s health. The U.S. bishops have long been concerned about the impacts and consequences of irresponsible extractives and mining operations throughout the world, especially in Latin America. In recent solidarity visits, we had the amazing opportunity to accompany bishops from the United States, including Bishop Richard Pates of Des Moines, to South and Central America. We heard powerful testimonials from community members, civil society organizations and religious men and women. We also heard from bishops advocating for their communities’ rights to live in a healthy environment and to have a say in the decisions that affect them. It was a moving experience to see how the lives of community members are impacted by irresponsible mining practices, and inspiring to witness their struggle for their rights to live out their dignity as God’s children, even in the face of persecution. 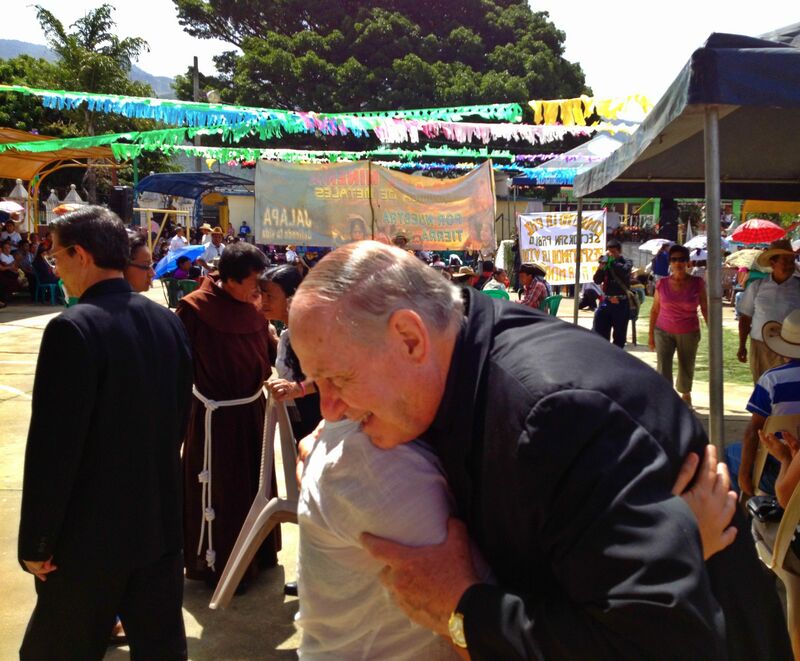 Bishop Pates meets with community members during a meeting in Guatemala on the effects of mining. The authors with Bishop Roque Paloschi. 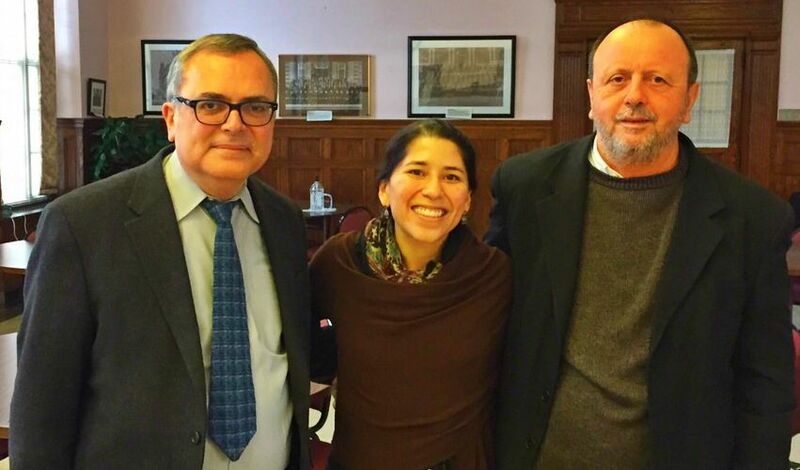 Cecilia Calvo is the coordinator of the USCCB Environmental Justice Program and Richard Coll is a policy advisor on Latin America and global trade at the USCCB Department of Justice, Peace & Human Development.